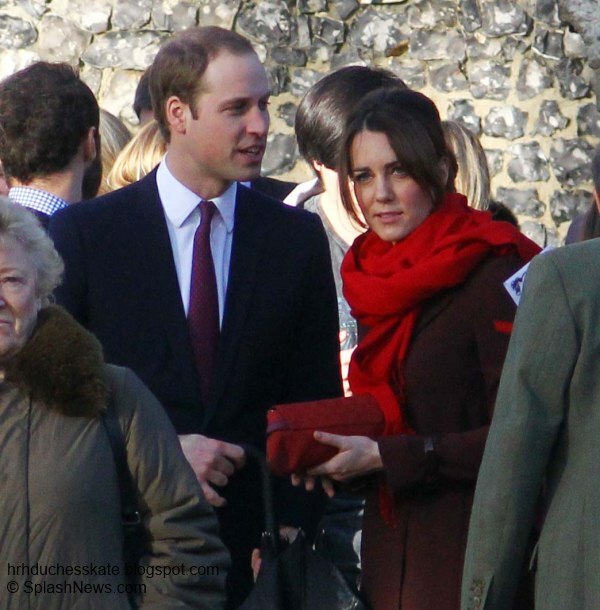 The Duke and Duchess of Cambridge attended the annual Christmas service at St Mark's Church in Englefield this morning. The couple were accompanied by Mike, Carole, Pippa and James Middleton for the service which was conducted by Reverend Ann Templeman. The family sat together in the church and enjoyed Christmas carols with the residents of Berkshire. As you all know, William and Kate are spending Christmas with the Middleton family at their beautiful home in Bucklebury, Berkshire. It has been reported Kate wanted to spend her last Christmas before motherhood with her family. The Queen joined the rest of the Royal family for the annual Christmas service at Sandringham this morning and spent time greeting the locals before leaving by car with Princesses Beatrice and Eugenie. Kate looked festive in her Hobbs 'Celeste' coat. 'Wrap up warm in this stunning double crepe wool coat. 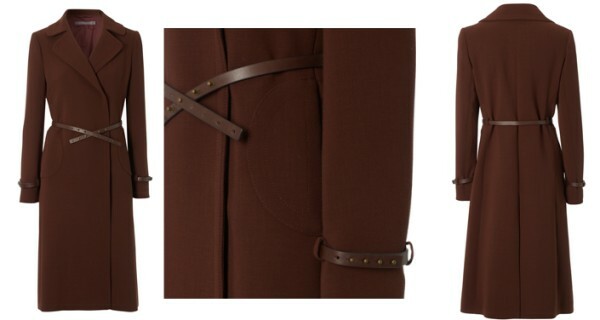 In a sumptuous seasonal chestnut brown, this coat subtly flares from the hips. It's given an on trend toughened edge thanks to the leather stud fastening, cuff straps and waisted belt'. The Duchess wore her Aquatalia by Marvin K 'Royal' Weatherproof Booties (also known as the 'Rouge'). Silvertone hardware details on the side of a weatherproof bootie fashioned with an elastic inset at the side for an easier fit. The slip-resistant rubber sole offers excellent wet-weather traction. 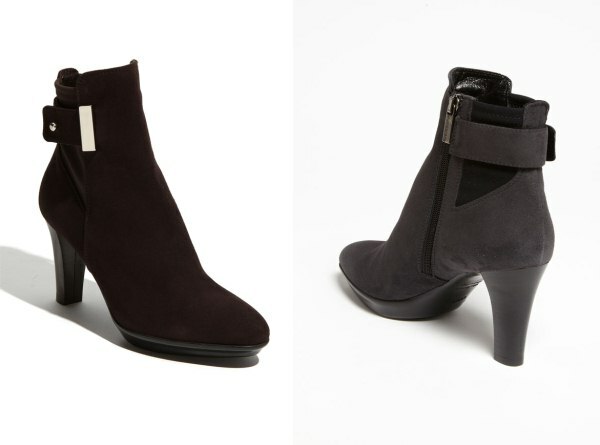 The €326 boots are available in sizes 5 to 12. 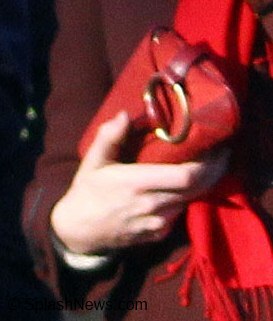 Kate carried her red suede Gucci clutch. 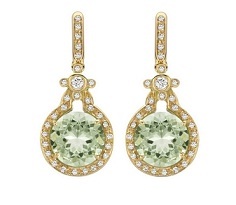 Kate accessorised with her Green Amethyst Kiki McDonough earrings. 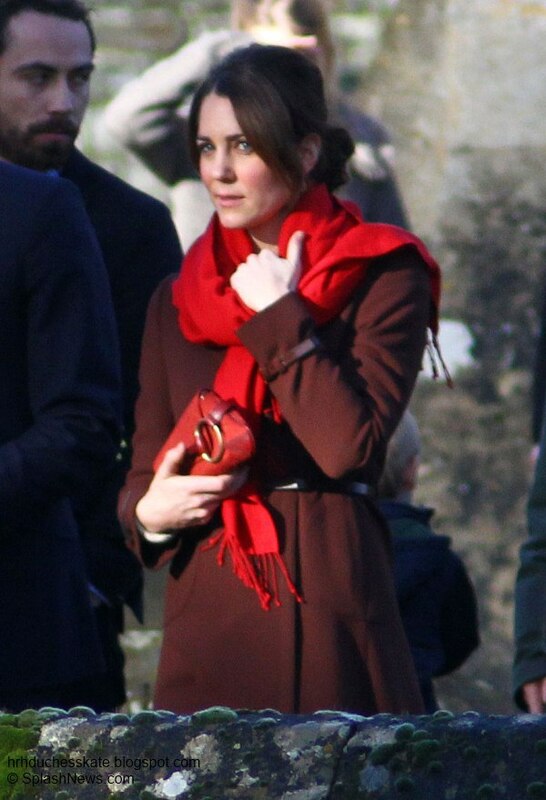 Kate completed the look with a red Hugo Boss pashmina and wore her hair in a loose bun. I thought it a lovely look, perfect for a Christmas service. The Duchess looked quite pale and tired, I hope she is continuing to recover but I know hyperemesis gravidarum doesn't disappear overnight which is why the couple's decision to spend the day away from the media spotlight was the best choice for them. The Queen's Christmas speech was broadcast today at 3 p.m. HM spoke about the spirit of the London 2012 games and how memorable the Diamond Jubilee celebrations were for the royal family. You can watch the full speech at the Royal Channel. What a surprise! Lovely to see the family together! When I first saw the photos, I was very glad she was able to spend this Holiday Season with her parents. She is looking very, very tired. I hope she can get all the rest is possible. That's exactly what I thought...The poor thing looks so tired! Same thoughts here...Hope the best for the young lovely couple. Yeeeah! Thanks for the update :) merry christmas to you as well! Thanks for the update! We all know today can be a busy day and thank u for taking the time to give us a post! I sure hope Kate feels better and it all ends up being a smooth pregnancy! I am also glad that they are breaking tradition and spending Christmas with her family. What a great way to celebrate the holidays! Have a very merry Christmas Charlotte and a Happy New Year if there are no sights! Merry Christmas Charlotte !! and to all !! Hope everyone is relaxing and enjoying being with friends and family. Merry Christmas, Charlotte!!! Thank you for the wonderful pics of William and Kate with her family. She does not look like she feels well, but she still looks beautiful as always. I hope she gets to feeling better so she can enjoy her family Christmas. Thank you so much for the wonderful coverage you have provided us with of William and Kate this year. Your blog is truly the best. I look forward to next year. 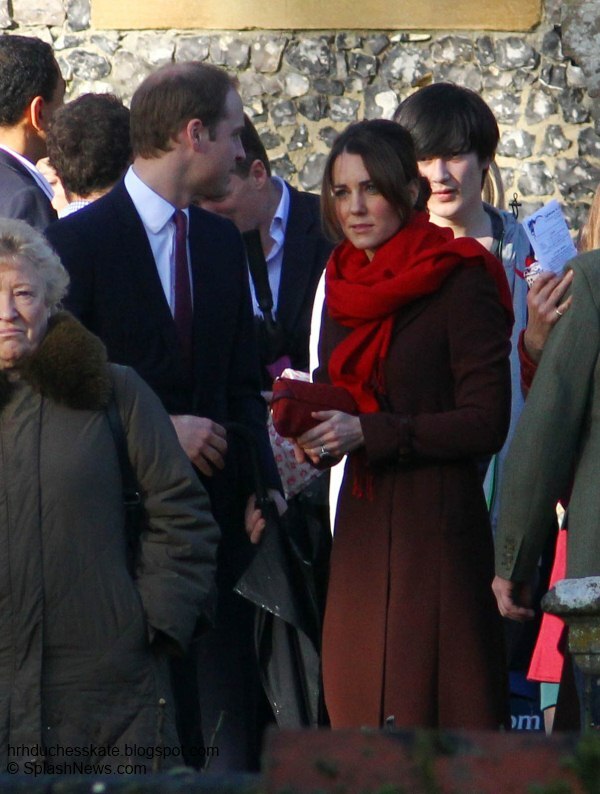 On a side note, did you see the gorgeous cape/coat Princess Bea wore to the Christmas service at Sandringham? Do you have any idea who the designer is? It is FABULOUS!!! I did some searching and apparently it is Dolce and Gabanna but I am not positive. I will keep looking. I loved it too - well done for finding it. I also loved her boots - any ideas? I had a good look and can't find any blogs on Beatrice myself either, which is a pity because her style is quite lovely as is Sophie's lately. Oooh Charlotte - I for one would LOVE it! I feel that the coverage of the wider family is quite poor - I pop across to newmyroyals - that often has more of Sophie who I think has really come in to her own style wise in recent years. See how you go though your schedule already seems quite full. Thank you Penelope, I really appreciate the feedback. It's going to be such an exciting year with Princess Madeleine's wedding, Harry returning and endless other events. I would love to write the blog again, perhaps focus on one particular royal/engagement per post rather than packing to much in. A Happy Christmas and New Year to all!! The duchess is beautifully turned out as always, but she does look very ill, a contrast to the way she looked at the Christmas party last week. Nice to see them mingling with locals. Does anyone know why this church, rather than the one expected? Possibly this church was picked for the family's attendance because it was not expected as it's not the closest church to the new Middleton estate. However, it could also be (just my thoughts here) that with the recent move this year, this was a church the Middletons were familiar with, have friends here. Another possibility that crossed my mind is anywhere William goes, there has to be an advance security sweep to be certain the site is safe and he can be kept in sight of his security detail in full protection. Maybe the other church that the press more expected did not meet the security needs. Honestly, I think it's wrong to post these snaps, when they asked for privacy from the press. Your licensing shows that you got these snaps from splash news.com a paparazzi agency. I think you should delete this post. You can see the duchess is offended in every picture PLUS, Bucklebury parishioners are being snapped without permission. What do you think? She smiles and workes so hard on her ON DAYS. Why couldn't she have a private holiday? All the blogger use Splash, a very reputable royal photographer uses them and we cannot afford to use big agencies like the Daily Mail. The photos were all over the internet including the Mail Online. I had an open discussion with my readers some time back asking them if they would like me to write these type of posts said I should. It's Christmas Day Roza and if you don't have something nice to say maybe's it's best not to say anything at all? There are many other Kate blogs you may prefer. I see you criticised photos I used in the last post on a popular FB page so perhaps this blog just isn't to your liking. here here if you dont like the blog and the photos she works so hard to prepare DONT COME TO THIS BLOG WHY WOULD YOU IF SHE IS DOING SOMETHING YOU DONT LIKE. I think Kate and family went to church expecting to be seen. The monarchy's connection with the church makes this important. They no doubt wanted to avoid the press camp out that would come at Sandringham, but being photographed is part of the job. Charlotte is doing a beautiful job with her gracious post and using the best pictures she can at her expense, so let's all keep the Christmas spirit. Anyone at church who didn't want to be photographed could keep their distance. I don't think the Duchess is offended, I think she just looks ill.
@ Roza: I think your comment is unfair and unkind towards Charlotte, who took time out of her own Christmas celebration to update us. These are not photos of the family being chased into or out of the Middleton's driveway. They're exiting the church after the service (something that was anticipated). I don't think Kate looks offended - I think she looks tired. And in the last photo Charlotte posted Kate looks quite happy and lovely. I doubt this ruined the family's Christmas because a degree of this is expected (by all) as "part of the job". And frankly, I believe that has always been Kate's approach to being photographed. Kate was completely aware what her 'job' and public profile would be once she was married. William has worked very hard to educate, inform Kate and also protect her when needed. He is acutely aware of the importance to be seen and photographed. They are public figures who have public lives. If they did not want to be photoed, there are certainly ways to have the royals escorted out the back side of this church into covered exits to waiting cars. In defense of Charlotte, first of all, Kate Middleton, now the Duchess of Cambridge, knew exactly what she was getting into as far as being in the public eye, when she started dating Prince William. The Windsors aren't the Joneses down the road, they are the royal family of the United Kingdom. So yes, there are going to be photogs and there is going to be paparazzi and their lives are going to be lived in the public eye. Keep in mind that in exchange for all of this, they lead lives of extraordinary, unimaginable privilege, wealth and benefits. I would guess that, for the Queen to make this rather extraordinary concession and allow Kate (and William) to skip the royal Christmas celebrations, it was made quite clear to all of them, including the Middletons, that they would have to appear in public at some point during the Christmas holidays. The Queen is the boss, no matter what anyone says, not Kate and not William. And I'd say she didn't let Kate get her way without Kate and William and the Middletons giving something in return, i.e. the photos coming out of the church. Keep in mind Princess Diana was pregnant during a Christmas at Sandringham, suffering from morning sickness and bulimia and she wasn't excused out of attending. It would have been nice to see some pics of the other royals walking to church at Sandringham. @Rosa- How dare you come on Charlotte's great blog & disrepect her. She is doing nothing wrong by posting these photos of the royal couple. They are in public and not at the Middleton home. If you do not like it then go somewhere else and get your royal information. We fnas here are very protective of Ms. Charlotte for a great job she does here mfor us fnas. So if you are not a fans, don't come back here. Sorry Duuchess fans but I am not going to sit quite and let someone disrepect our Charlotte. So I hope you all understand. Thank you in advance for standing behind me. I agree W&K were out in public if they wanted 100% privacy they should have stayed home, but they did not and the Daily Mail reported that their bodyguards made no attempt to prevent photographers from taking their photos, although the DM did not publish them in the paper today. Don't shoot the messenger - in this case our lovely Charlotte who does such a great job. I don't think Roza is wrong and since this post the Daily Mail has withdrawn the pix following a complaint from the Palace. "Police had cleared a space for the Press to stand and even moved away some vehicles to give photographers clear sight of the church. Yet, last night, the Palace insisted this very public event should remain private, and that none of the pictures be printed – a request we have reluctantly agreed to. The Mail, of course, wishes the couple a happy and relaxing Christmas. But we also hope the Palace understands the frustration it has caused by adopting such a baffling and illogical position." So apparently, William and Kate did NOT want the media there, although their staff seemed to facilitate the press's ability to take photos of the Middletons. Personally, I think it's a huge mistake for William and Kate to try to intimidate the news outlets into taking the photos down. They come off as a bit spoiled and entitled if they think that they can stop reputable newspapers from printing photos of them out in public on Christmas (a day when all of the other royals did their duty by attending the events and services at Sandringham). Frankly, I'm shocked and think the palace needs to sort this out and possibly reconsider the employment of whoever was behind this. These pictures have been printed in highly reputable papers in the US and Canada (and on People Magazine's website) and yet the British newspapers are being intimidated into not printing them. The very country that supports the royals, provides their security and many other benefits, are not being permitted to see perfectly decent photos at a public event, where provision was made for the press who were there. None of us who go to church have an expectation of privacy. These are not sneaked photographs. The purpose of the royal family is to be SEEN. That why royal progresses were made before the days of the press. Kate and William would be shocked and not too happy if the press stopped covering their public engagements. At a time, when republicanism is rife, they need to be more reasonable about this. There are both benefits and burdens to their life as there is for all of us, and Kate was aware of this when she married and made her choices. To enjoy the benefits, and there are many, they need to accept the public interest that comes with it. I happen to agree with you. Prince Phillip is 92 and he managed to walk from Sandringham to the church. The Queen takes a car so there was that option available. They either need to step aside in favor of Harry if they really want to not live their lives in the public eye or they need to buck up and get used to it like the rest of the members of the royal family. It will probably raise hackles with the Kate-worshippers but the royals seemed a bit jollier this year, in the pics I saw of their walk to the church, without the presence of Will and Kate there. I agree with the comments here . Sometimes they do appear spoilt and petulant. It's all on their terms. What happened to freedom in the press. As a British taxpayer it makes me mad they manipulate the press. How would they feel if the goodwill of people stopped going to support them at their engagements. They r privelages and born into the roll it's something they have to put up with thru can't cherry pick. Makes me loose a little respect for them. Which is a shame. Thought we were going to get a fresh young royal family instead of r old fashioned one. Like the way the European royals hold court much more modern and in touch with their people. I'm a Kate fan but I think she and Wills made a mistake. Pregnancy is not a disease, nor is it a disability. I know she had the HG but she also went to two lunches/parties and the awards show. This makes K&W look bad and I've lost some respect for her. My mother had a high risk pregnancy but still worked as as housekeeper until I was born and my grandmother was a farmer's wife who chopped her own wood, milked her own cow and killed her own chickens while pregnant. Life and work go on. I, too, have been a big fan of Kate from her first appearance on the scene--and of William since his birth! Yet I am perturbed and puzzled by the palace's bizarre request to the media not to publish the pictures of Kate and William on Christmas Day at church with the Middletons. Did that request originate from William and Kate? (I hope not!) Or did the palace perhaps object to pictures of the Cambridges being taken somewhere other than at Sandringham? The pictures in Berkshire did not appear offensive to me--not terribly closeup nor intrusive of the family's worship time nor disrespectful in any way. Conversely, many of the pictures of grieving families leaving their children's funerals in Connecticut USA last week were intrusive and disrespectful. Unfortunately those poor parents had no "palace" to intervene for them. The full story is that the Palace talked with main stream UK papers and requested that they give Catherine privacy and not take and print pictures when she is "off duty". The Daily Mail was one of the papers that agreed to do that, and they admit this in the article. The Palace have no control over foreign press or freelancers - and they turned up. The local police were responsible for traffic and controlling the area - not anyone from the palace. The Daily Mail then published pictures which they had agreed NOT to do. That is why they were taken down. Give these 2 a break. She's been ill, is obviously not 100% and who knows how long it will be before she is better. Peopel who follow Catherine need to consider her needs and not their own and some of the posts on here are very unkind. Like you, I love to see her and William out and about, but a request for privacy should be respected. I have to say that I haven't thought of it the way Anonymous 2:12 described it- the job and purpose of modern royals is to be seen. I think it is a very important distinction. I'm a huge fan of the Cambridges, but I do hope they learn to handle the good and the bad a little better. Their roles provide them with so many opportunities and luxuries. Forgive me if I don't see the need to stifle the press based on the whims of the royals. It is just part of it. For all we know, the couple allowed the pictures and then decided they didn't like them so they sent out the word to nix it. I'd like to think they aren't that shallow- but who knows? In my opinion- if they are not on private property, it's free game to take pictures. Heaven knows they have plenty of places to go and be private. All that said- Charlotte you are wonderful and this post was very tastefully done. Thank you. I tend to agree that the outfit didn't coordinate as much as I like, but Kate looked lovely. Really illustrates her effortless grace and beauty! Merry Christmas Charlotte & everyone :) What a wonderful day. The Queen's speech was fantastic, what a brilliant year for the monarchy and the United Kingdom. Well done for your excellent blog, long may it continue! Merry Christmas from the United States and thank you for the pictures. She does look very tired. Hopefully she can relax with her family and enjoy a quiet uneventful Christmas. Thanks for the photos but it is so strange to see the duchess so pale and not her usual cheerful self. I hope the rest of her pregnancy is better for her than the beginning ! Happy holidays to you and thank you for your lovely blog ! I guess it would look bad if Kate came out looking glamorous and smiling... She has used feeling ill as her reason for not joining the Queen at Sandringham, so she therefore had to look the part..
Lucky you to have been in on the Christmas day planning between the Windsors and Middletons. No excuses necessary here. It's simply a normal and fresh approach to honor BOTH sides of the family. (The pregnancy simply makes it even more beneficial to Kate this year.) Kudos to William for stepping up and being a supportive and loving husband. Lucky you to know what is going on between William and Kate! I agree RoyalFan, it's the media who keep bringing up Kate's illness as the reason for her staying with the Middletons. I think they will continue to alternate in coming years. You don't seem like a very happy person. Have you ever experienced morning sickness or HG? Anonymous, I am offended that you would judge Duchess Kate and her pregnancy induced illness. There was a very clear article stating that even before both the Duke and Duchess knew of her being pregnant, they had already asked and been given permission to spend this years Christmas with the Middleton family. Thus making your comment rather silly if I must say so myself! God bless and may His love and peace be with you! The bottom line here is that this has nothing to do with where William and Kate spent Christmas. In the eyes of those who are determined to hate Kate, she will never get it right. Before she married, she was a doormat, always pleasing William, there was no affection between them, and he would never marry her, etc, etc. Now that they're married (and clearly happily so), suddenly she's wearing the pants in the family and refused to spend Christmas with the Windsors which I guess would mean that William has become HER doormat. LOL. On the other hand, if they HAD gone to Sandringham again, she'd be accused of turning her back on her own family and Ma Middleton being accused of going along with anything to climb that social ladder. I guess the more realistic scenario of these two being a great match, very much in love and supportive of each other, is too hard to swallow for some folks. Given all the time that William has spent with Kate's family over the years (plus having lost his own mother as a teenager), and his own statements during the engagement interview, I don't think it's far fetched to believe that he actually loves Kate's family and enjoys being with them. I hope they had a lovely Christmas with her family and continue to live their lives with the love and joy that is so obvious between them. If it had been decided ahead of time, why all the last minute prevaricating? Last week, it was going to be decided at the last moment depending upon whether Kate felt up to it, then it was announced they were going to Bucklebury a couple of days before Christmas. I blame William, not Kate. Just saw the Queens Christmas broadcast..... oh my gosh I have loved her since I was young and even more now. God save the Queen! Kate looks like a completely different person without her hair and makeup done! I actually think she looks a lot better this way - softer, younger, and more natural. Usually her blush and eye makeup are somewhat harsh. I can see I'm in the minority though as most people think she looks tired. I think she looked MUCH younger without the heavy makeup, especially that thick eyeliner and with her hair up!! And as for her looking "tired," as someone mentioned, it probably wouldn't do for her to be giggly, dressed to the hilt and bouncing around, since her illness/pregnancy was cited as the reason for the absence from Sandringham. Thank you for taking time off from your Christmas day to write this post, Charlotte ! I like how Carole, Pippa and Kate have all coordinated! Merry Christmas! Thank you, Charlotte, for the lovely Christmas gift of another great post! It was so nice of you to take time away from your family celebration to update all of us. I hope you enjoy the comments from the followers who appreciate your wonderful blog and disregard the rest! Merry Christmas to you! :) I love Kate's hair like that! Thank you for a wonderful post, best wishes to all for a Merry Christmas and wonderful 2013. I am shocked people made comments about the posting a pictures from a public area. Charlotte, you are so gracious especially if she is using social media to make her case. I always wonder why some people are so lacking in social skills that they can't just move on rather than vent on social media. I for one wish some people would get a life! I too think she looks ill but still younger without the harsh eye make-up! I appreciate the post. Just wanted to let you know that our FAVORITE (heavy sarcasm intended) photographer Niraj Tanna is reporting on Twitter that the Palace is insisting on censorship of the WK photos, that's why they've disappeared from the Daily Mail. I'm not sure what the rules are regarding your photo agency but just wanted to let you know - don't want you to get in trouble. Thank you Charlotte for taking time out of your Christmas Day to bring us the great information on the Duchess & her Prince's day with her parents at church. I do have to agree that the Duchess looked very tired & pale. 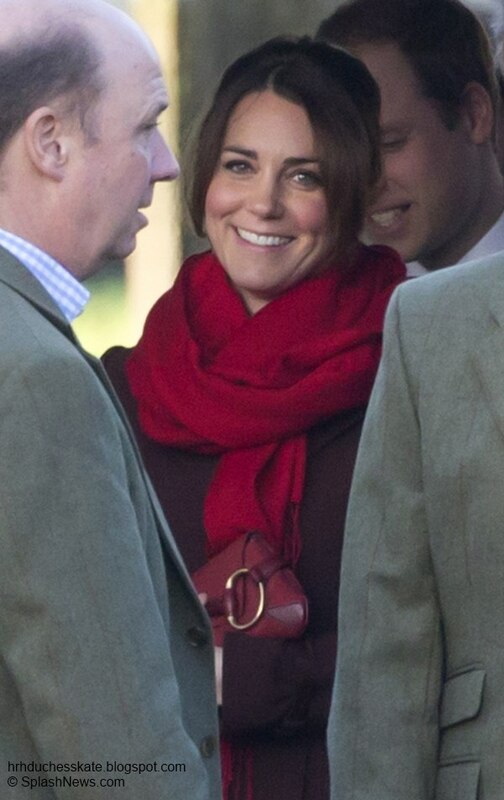 But then again she looked happy to be with William & her family. I am happy that William let the Queen know that his wife is not up to all the stuff with the royal family. William will make sure she is well taken care of. I am glad they didn´t attend at Sandrinham, they are not needed. then why on earth follow a blog dedicated to someone who is "not needed"? LOL. I think anon02:37 is correct. I'm pretty sure the Queen doesn't NEED her grandson's wife to be present in order to have a good time. I disagree with the last 2 Anons sure the Queen probably had a delightful time with all that were with her but that doesn't mean she didn't miss William Kate and Harry. They are all so beautiful. Thanks for the pictures. Merry Christmas, Charlotte! Thank you for you cheerful and consistently positive posts. You do a beautiful job and it is much appreciated. God bless you! Hope you have a nice break. Charlotte, you have done it once again! Your blog reporting was spot on and I thank you for your labors! I noticed comments about Kate looking tired and my honest first thought was.......she is pregnant! When I was pregnant, my first 3 months were a series of nausea, vomiting, being extremely tired and working and sleeping(along with trying to figure what would make me sick and what I could actually keep down!) LOL! All in all I am charmed by how sweet and beautiful Catherine looks inspite of the obvious changes she is dealing with to bear a healthy baby and be as healthy as she possibly can! God bless everyone on here and may your New Year be especially bright and prosperous!! I really do love that coat that Carole is wearing. The cuffs and collar are lovely. And yes, she's worn that coat before. Kate's mom usually dresses better than Kate. I never liked the coat Kate is wearing. It's such a dull and matronly color. But I do like the little belts on the cuffs. I like the little belts on the cuffs too but I was hoping she would be in a nice red. What a fun surprise to log on and see pics from the day! So happy they could be together as a family. Kate did look worn down. I LOVED the last pic of her smiling. Despite her being tired, she had a beautiful smile. Hoping they had the relaxing day they were hoping for. To the person who had negative comments about the blog and post.....shame on you. If you don't have anything kind to say, don't say it. Charlotte, your efforts and commitment are always appreciated, but especially that you took the time on Christmas Day to give us this lovely post. Good job defending it too! 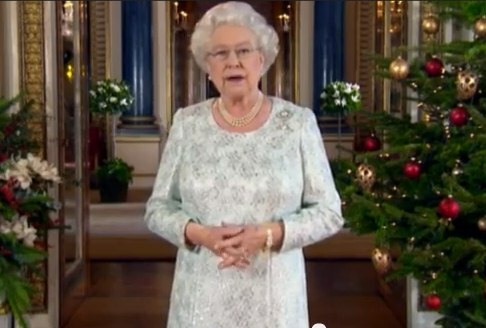 I loved the Queen's Christmas speech. She truly is amazing and I love her! I had the opportunity to travel to London for her Diamond Jubilee celebrations this past June. I saw her float down the Thames, celebrate at the concert, and travel down The Mall in the carriage procession. All of it was brilliant and such a great historical event! I stood on the Westminster Bridge to see her come down the Thames. As I watched the broadcast and her remembering that special day with pictures of right where I stood, it really is a reminder of how incredibly special it was. LOVE the Queen! Charlotte, thank you again for the post! Merry Christmas and hoping for a post with Will and Kate celebrating in Sandringham! Oh I so wish I could go to England. Maybe some day. You are so fortunate to have witnessed a special part of history! Happy New Year! Sarah, it truly was amazing! As I look back at pictures, I have to pinch myself to think I was actually there! My only regret is not purchasing a really good camera before going. After all the amazing events I witnessed, to end the Jubilee celebrations I hurried down the length of The Mall and actually got up in front of the palace for the balcony appearance. Kate looked stunning in the blush Alexander McQueen dress. Really a moment I will never forget! I have been a Royalist for many years and have always wanted to catch a glimpse of the Queen. So, I made the trip to witness this part of history. Hoping to go back for Trooping the Colour next year or the year following. Long live the Queen! I too was excited to see pics of William and Catherine today! Wish she hadn't cut her hair though I don't think it is becoming to her. I think it makes her look like she has not put any effort into styling it. I think she looks fine, but William looks like her dad older by the day..
Just found the coat Carole Middleton wore for Morning Service on Christmas. It's appears to be the same one she wore to Prince Willia's Passing Out Ceremony on November 17, 2010. Now we know where Kate acquire her frugality -- buy good quality pieces and enjoying them repeatedly for years. Dapper Kate! And still smiling. When I saw how she was shaking at the Spotty awards I realized how sick she was. Some said it was due to nerves but that is also not typical of Kate. I think she has had a challenging year and even her pregnancy anouncment was not as planned and linked to also the prank call incident. Anyway, did anyone else notice the colour co-ordination between mom and daughters whether coincedental or deliberate? I think they looked lovely. Charlotte: Merry Christmas. I'm sure many will agree that your site/twitter/FB is one of the first site we turn to every morning. Your tireless commitment to bringing us lightning fast photos and updates is appreciated by many. Unfortunately, success attracts not only fans but haters too. Fortunately, the latter are grossly outnumbered. Perhaps we can block a few...? Having said that, D.O.C looks very tired and this is one look that really didn't work for me. The scarf seems to clash against her coloring and her coat. This endears me more to her, however, because she is human afterall and the poor thing must be feeling awful despite the brave smile. Happy Holidays to all HRH fans and to Charlottee! I love the Duchess and this blog. But I have to say, I really don't like this look at all. The red scarf just doesn't "go" with the coat, and the dark stockings and boots make it worse. Even the reds in the scarf and clutch are off. I love so many of her choices, but this I just keep looking at and thinking she could have done so much better! Weird. It's not an official engagement and there was no need to work on her outfit. Perfect color combination for Christmas! Very festive! Come on people give the Duchess a break on what she is wearing. She has not been feeling good and she probably doesn't care what she is wearing. So we should not either. As all her appearances are not on royal duty so she is just going through the motions. I have been wanting to tell you how very much I enjoy your blog. It is respectful, elegant, and beautifully presented. I just adore Duchess Catherine, and love seeing the lovely pictures of her, which you present so very well. I have never felt that you are at all intrusive or disrespectful, and you are to be commended for that. Keep up the great work and have a great New Year!! I've been thinking... Do you think it is possible the Duchess may have read this blog at least once? Because I think it is possible! The Duchess of Cambridge is so pretty. Also, the pictures of rural England are beautiful. Loved the red scarf and glad to see her smile even though she probably feels rotten. I wish she would burn those booties though! so glad to see them out! Thank you Charlotte! Merry Christmas to you and to the Duchess and Duke and their baby. God bless you all. The combination of burgundy and red is not a good choice. I would prefer grey scarf and clutch, like her shoes and socks. Charlotte you have the patience of a saint. I saw these photos on dozens of sites and other Kate sites such as What Kate Wore. I don't understand why people always gang up on you. The photos were taken in a public place exactly the same as when they attend weddings. I love William and Kate but trying to control the media is crazy. My apologies for what must have been an upsetting Christmas Day for you dealing with this nonsense. I run a couple of blogs of my own and take my advice don't publish those trolling comments. Anyone who reads this site knows how much you respect Kate and how hard you work to provide this site for us. Kate looks sick and exhausted hope she gets some much needed rest and stops doing all appearances until she's given birth . As much as I'll miss her I feel she needs it look at her face plus she deserves it. Happy new year Catherine. I was looking at What Kate Wore blog and you can really see the difference in how Kate looks now. Their are some previous pictures from her day in Liverpool and on her trip to Canada with some from Christmas Day. I really pray she starts feeling better. Do we have any idea on how far along she is? All I have read is baby in summer 2013. It's hard to judge properly from a single set of pictures -- which were very likely taken from afar and not under the best circumstances. William and Kate don't smile at paparazzi. They'd have likely spotted the snappers, hence the serious faces. Hopefully Kate felt better than what was captured on camera. More importantly, The Telegraph reports that William & Kate have arrived in Sandringham on Boxing Day, with William taking part in the traditional shoot led by Prince Philip. It's always a relief to hear that Kate is well enough to travel. It is, after all, a long drive from Berkshire to Norfolk. Hope all is well and the rest of their holiday stays restful and private. I would love to see coverage of other royals. If you can fit that into your already busy schedule, it would be much appreciated. :) THANK YOU. Friends, to be honest, that Kate's pregnancy is becoming something quite confusing. I, like many people here, I do not understand why they ask for the photos of William and Kate leaving the church with Middleton at Christmas were not published. And then she looked in the pictures was not feeling well, shortly thereafter, William and Kate are already in Sandringham to spend Boxing Day and according to tabloids, they plan to fly to Scotland to spend the new year. This whole story, ie, one day Kate looks bad, the other day Kate travels three hours to Sandringham etc, etc, has given rise to the apparently baseless conspiracies such as Kate would not be pregnant or have never been pregnant, William and Kate turned to a surrogate mother to conceive a baby or they did IVF. Anyway, while we do not have a better statement prepared by St. James Palace, more and more speculations arise. So I think a more elaborate explanation on their part would be important. Kisses from Brazil and Happy New Year everyone! This disease have it's ups and downs. I would totally disregard any tabloid stories about IVF and surrogates. I'm not discouraging you from reading them, of course - but maybe look at tabloid stories as entertaining and speculative reading. After all, the tabloids have been predicting that Kate has been pregnant since the wedding. However, Kate was pregnant about a year and a half after her wedding, which was not a long time to 'wait' especially when there reasons to wait (Canada and Jubilee tours). Also William is on record as saying (the engagement interview?) words to the effect that they wanted children, but wanted a period of adjustment to being married first. So it is my opinion that Kate actually got pregnant relatively quickly once they decided to start a family and that tabloid speculation that they resorted to IVF or a surrogate is, well, in my opinion, ridiculous. Hi Charotte-just received my Celebrate book by Pippa. I tkink it is lovely full of great ideas. In America I like Martha Stewart and Ina Garten and trust me they have a lot of help. My coworker joined the critiques having not even seen the book. She is a royal fan too. So I think I'll make her wait to see it. Ha ha for us it's all good fun. I will say having seen the book now I think all the criticism was terribly undeserved. Go Pippa! I hope William and Kate have a relaxing rest of the holiday season where ever they decide to stay. I agree with you, the book is very much like Martha Stewart's whose books are hugely popular who often gave quite simple recipes because that's what most of us have time to cook. The press focused on one or two of Pippa's recipes only. If she had been an unknown author, I believe her book would have been well received. But she might not have had a chance to write it too and certainly got a much bigger advance than most first time authors. So there are trade-offs. I would love to have another blog about the royals by you, dear Charlotte... I didn't know about "The Royal Digest". I have a feeling Princess Beatrice might soon get engaged. She looks radiant ! And there is Madeleine's wedding, as you said. though Autumn and Sophie's children are older than the new baby (babies?). Has Blogger changed the way to comment ? The presentation is different, and not as nice as before. And we can't answer any individual comment as before, as there is no "reply" tag. Do you know anything about this, Charlotte ? The comments are now returned to normal. Unfortunately people with i phones are experiencing difficulty commenting, another bug in blogger I'm afraid. We tried changing the comments to a full page but it didn't work and as you said meant readers couldn't reply to specific comments. Thank you for all the feedback regarding the other blog. My plan would be to cover the biggest stories rather than trying to fit everything in and as always this blog is my first priority. Oh yes, comments back to normal ! Great... They are much nicer to read like this. I have been reading some of the comments here and I agree & disagress with some of them. First I don't think it was William or Kate that asked to have the photos removed. I feel it came from St, James Palace for whatever reason. Yes they are public people but they were not on offical royal duty on Christmas day. So the press should have left them alone. And the fact the the Duchess has been so sick and in the hospital they should not have been at the church. We also have to remember how protective William is of his Duchess. And now the Duchess has a royal protection officer for their unborn child. So that is another person following her around. I say let's just sit back and let her get the rest she need's and hope the press will leave them alone for awhile. And for Charlotte about doing another royal blog, I am for it as long as you continue doing this one for our Duchess & her Prince and not mix them together. I am not really interested on the York Princesses because I feel they do not pull their weight but want all the things that go along with beign princesses. I am saying this abouth them because we never here much in the papers regarding them except for them going to parties. But I would like to know more about Sophie, Countess of Wessex. That is only if you have the time with school and your boyfriend & family. I read the last paragraph of your comment with interest. I also would like Charlotte to do another blog, for the reasons you state and also because the BRF is definitely moving towards a more streamlined 'firm'. For example, a balcony appearance in 2012, included only The Queen (Philip was absent due to illness); Charles & Camilla; William & Kate; and Harry). It is known that Charles apparently will have a more streamlined BRF when he becomes King and HM the Queen appears to be in support of this. So it is likely that engagements will be sharply curtailed in the years to come - so there will be less royals to cover engagements. However, I believe that there are procedures now being put into place which support a hypothesis that I have that minor royals will, in future, be remunerated with an appearance fee and expenses for undertaking engagements at the direction of BP. The remuneration would, of course, then come from Charles' - and not the public's - purse. Just my opinion, of course, but all signs are pointing towards this. I just want to let you know that several Pauline's comments are offensive and adding the phrase "just my opinion" does not make the difference. Thank you Glamour Lady, we certainly don't encourage criticising of the other royals. @Glamour Lady- I am sorry I offended you by my comment regarding the York Princesses. I stated in my comment the reason I was saying what I said. We here in the states do not hear much about them unless they are going to or coming from a party. We never see anything about them in magazines like People, Us, In Touch, etc. I don't see how that was offensive. And Charlotte does cover the Duchess's charity work in her blog. And by adding "In just my opinion" does let other read's know that this is me and nobody else thinking this way. You do not have to agree with me or any other reader here that post a comment. Charlotte has a great place here for us Duchess fans to voice our opinions and if they get to be nasty or not nice, she will not post them. So again I will say I am sorry if I offended you. But I still stand by my comments regarding the Princess's. @ Pauline, isn't it a bit hypocritical of you to judge the York girls based only on what's covered in the media? You're the one who's always quick to jump to Kate's defense when people say she doesn't do enough charity work, takes too many vacations, or spends too much time shopping - in fact, you're constantly assuring any doubters that she must be doing charity work behind the scenes. So why not give the York girls the same benefit of the doubt? Princess Beatrice is only 24 and she has a college degree. A quick Google search reveals that she has participated in the following charitable endeavors: visiting HIV-infected children in Russia, doing events on behalf of the Teenage Cancer Trust and a children's literacy group, and running the London Marathon to raise money for Children in Crisis. Princess Eugenie is 22 and has a college degree as well, and has also done work with the Teenage Cancer Trust and has taken on a role as a patron of the Royal National Orthaepedic Hospital. Just last week she visited young children who had had spinal surgery at the hospital, the same one where she underwent surgery to correct her scoliosis as a teen. Personally, I don't think it's necessary for Kate fans to pit the other female royals against Kate to prove that Kate is the "best" royal. They're all different women and are going to have different roles based on their positions in the royal family, ages, family status, and other careers. Personally, I think the York sisters seem like perfectly nice women, so I'm not sure why you constantly put them down on this Kate blog. I've always been impressed by their grace and class in the face of some rather public mocking on account of their fashion sense, weight issues, or their parents' antics - I thought it was pretty clever that Bea decided to auction that much-maligned wedding hat for charity after the global media made fun of her. Long story short, I think you need to cool it on putting down the York sisters. Remember, if we only judged the royals based on the activities that got coverage in the media, Kate wouldn't have come off too well when she was the same age as Bea and Eugenie. I seem to remember that the only media coverage she got in her early 20s was for going to clubs, vacationing with William, not having a job, and being a "waity Katie" while she waited for William to propose. Fortunately, the media's portrayal of her changed after the wedding, but Bea and Eugenie might not be so lucky. I'd love to see Charlotte's coverage of them and their charitable/royal activities. I can appreciate some of what you say, but I'm not sure it's fair to compare the coverage (or expectations) of two royal princesses to that of a private citizen, which is exactly what Kate was in her early 20's. I never said anything about the expectations of Bea and Eugenie versus early-20s Kate. I was simply pointing out that the press can pick and choose how they want to portray people. During Kate's post-college years, she was consistently portrayed as an unemployed party girl waiting around for William to propose. I assume that her supporters (of which you and Pauline are among the most ardent that I've seen) would say that the media's portrayal of her was unfair. I think it's perfectly legitimate to point out to Pauline that the media portrayals she has seen of Beatrice and Eugene in People, US Weekly, etc, may also unfair. If you read the daily mail article you will see that they admit that the palace asked for the press to respect the couples privacy and not intrude on their privacy. And the papers agreed. This was BEFORE the couple went to Church on Christmas Day. The Daily Mail also write that they did not send a photographer to the church because of this request. However, when pictures emerged from independent sources, the Daily Mail published them, therefore breaking their agreement with the Palace. The palace pointed this out and the Daily Mail took the pictures down. That is the order of events. You might want pictures of them but private time and space are needed and privacy should be respected. Ana Laura, I have not read about any "conspiracy" theories regarding Kate's pregnancy, although I wouldn't be surprised. Personally, I don't see anything confusing about the situation. As with any pregnancy, Kate will have to take things, and make decisions, one day at a time. If there IS any confusion out there, then it's being generated by tabloid papers that are putting their own spin on things, as well as the people who can't wait to jump on these stories and add their negative comments. Nothing new here. But how sad that even a pregnancy, which is such a special time for a young woman, isn't immune from it. If you re-read articles from the Daily Mail they admit that the palace sent out, before Christmas, to all British news sources - including the Daily Mail - a request to respect the privacy of William and Kate. The Daily Mail notes that among the photographers present on Christmas Day was Reuters - a respected international news agency. The Daily Mail says after they published the photos, they were then 'bizarrely' asked to take down the photos, and they complied. It is true that the Palace apparently sent out pre-requests to respect the couples privacy to British news sources. However, Reuters is an INTERNATIONAL news agency - who took those photos for publication outside Britain. In my view, the Daily Mail attempted an disingenuous explanation to their readers that the photos were made available - including some from Reuters - a respected source - so, they had the right to publish them. (Of course, the Daily Mail conveniently left out the part that Reuters not only supplies photos to British news sources, but worldwide news sources, and Reuters was taking the photos for publication outside Britain). As to the photos being published here, please note that bloggers did not receive a pre-request from the palace; the photos are readily available outside of Britain; and that I'm sure, that if asked by the palace to take them down, Charlotte would. Therefore, in my view, Charlotte has firm moral ground to leave the photos on this post. I haven't got a problem with Charlotte. If I had I wouldn't be here. I doi have a problem with posters who say this is all down to William and Catherine. The problem lies with the Daily Mail. The Daily Mail is a rag of a newspaper. It wrote an article in which it tried to shift the blame from themselves onto William and Catherine. If you live in the UK this will come as no surprise. I have always supported Charlotte, especially when she had issues with photos last year. My advice - which she doesn't have to take, is beware the MAil when it prints "private" events. I stand by my statement that the privacy of William and Catherine should be respected and people who support them, like me and you, should do that. I see now that we are indeed pretty much on the same page about this issue. We definitely agree about the Daily Mail is a rag of a newspaper. There seems to be a great deal of nonsense on the Daily Mail blog, we should just ignore most of it. When it was officially announced that the Duke and Duchess would be with her family for Christmas, I felt it was done just in time to avoid disappointment to children who might have gone to Sandringham with flowers for Catherine, as they did last year. At the same time they asked British newspaper photographers to stay away, to avoid annoyance in the village. Can you imagine the congestion if the numbers who camped outside the hospital has turned up outside the church.? I cannot understand why people are so upset at the young couple not going to Sandringham---the Queen could surely not complain as she did the same thing herself, leaving Charles at Sandringham in 1949 and Charles and Anne in 1950 and going to Malta to the Duke. I thought Catherine looked a little fragile on Christmas day, but assume that either the anti-emetics were working or she has reached 12 or 13 weeks and has stabilized. Sickness in pregnancy varies so much and comes at different times in the nine months---some have it throughout. You cannot really compare one woman's experience to another. For our overseas friends don't get too upset by what you see in the Daily Mail---they once quoted me on their front page, when I had not even seen their reporter, let alone spoken to him! Happy New Year everyone---and a little peace and rest for Charlotte. with them? anyone seen lupo lately? Loved, loved, loved the queens christmas message again this year. I do feel there needs to be a distinction made between clearly papped pictures such as the ones taken in France and on the honeymoon, versus standard journalism. Once Reuters covered the event - all publications, The Daily Mail, The Telegraph, all the other British papers, Hello and/or anyone else who was asked not to publish, should have been released at once to publish the photos if they wished. This makes a distinction between photos that SHOULD NEVER HAVE BEEN TAKEN, versus protecting the church from a mob scene. If the palace declines to make this distinction papers like the Mail may stop making that important distinction and publish what becomes available. In this international world, this is the only thing that makes sense. The royals also should not be providing income to a foreign news service at the expense of those of their nation. At the end of the day, it will be the British papers who decide whether or not to encourage republicanism, not Reuters. Okay off track as usual. Watching Les Miserables 25th anniversary on PBS. Hopefully will see the movie tomarrow. Just makes me think how fortunate we all are to live in this generation with so much freedom. Freedom to voice all our opinions. Yet there are some who still don't have this freedom. Hey Ladys, I don´t know if the question was written above, but does the Middleton family live in their new, bigger house? we eventually stumbled upon a half dozen of them in the clear waters.